In 1882, Dubuque was an hour and a half town – at noon everything shut down for an hour and a half when everyone went home to dinner. Mr. J. K. Graves, a former mayor, former State Senator, also promoter of mines and a banker lived on top of the bluffs and worked at the bottom. Unfortunately, he had to spend half an hour driving his horse and buggy round the bluff to get to the top and another half an hour to return downtown, even though his bank was only two and a half blocks away. Mr. Graves liked to take half an hour for his dinner, then a half an hour nap, but this was im-possible because of the long buggy ride. As a traveler he had seen incline railways in Europe and decided that a cable car would solve his problem. He petitioned the city for the right to build. The franchise was granted on June 5, 1882. John Bell, a local engineer, was hired to design and to build a one-car cable modeled after those in the Alps. The original cable car, which was built for Mr. Graves’ private use, had a plain wood building, that housed a coal-fired steam engine boiler and winch. A wooden Swiss-style car was hauled up and down on two rails by a hemp rope. Mr. Graves’ cable car operated for the first time on July 25, 1882. After that, he had his gardener let him down in the morning, bring him up at noon, down after dinner and nap, and up again at the end of the work day. Before long, the neighbors began meeting him at the elevator asking for rides. On July 19, 1884, the elevator burned when the fire that was banked in the stove for the night was blown alive. After Mr. Graves rebuilt the elevator, he remembered how his neighbors showed up when he used the cable car and he decided to open it to the public. He charged five cents a ride. The elevator burned again in 1893. Because there was a recession Mr. Graves could not afford to rebuild the cable car. The neighbors had come to depend on the elevator to get them to work, to church, to school, and to the market. 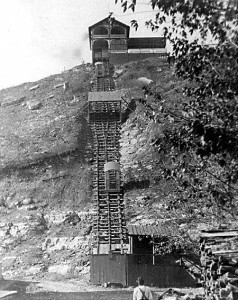 Ten neighbors banded together and formed the Fenelon Place Elevator co. Mr. Graves gave them the franchise for the right of way for the track. This group traveled to the 1893 Colombian Exposition in Chicago, Illinois, to look for new ideas. They brought back a streetcar motor to run the elevator, the turnstile, and steel cable for the cars. They had remembered that each time the elevator house burned, the fire also burned through the hemp rope that held the car and sent it crashing down the hill destroying it and the little house at the bottom. Then they in-stalled three rails with a fourth bypass in the middle to allow for the operation of two (funicular) counterbalanced cars. By 1912, C. B. Trewin, who had built a house next door in 1897, became the sole stockholder. It was natural for him to buy up the stock from the original ten stockholders as they either passed away or moved away. Mr. Trewin added garages to the north and south sides of the operator’s house in 1916. He also added a second floor apartment which the neighborhood men used for a meeting room where they could smoke and play cards without the wives interfering. There was another fire in 1962. That time an electrical fire between the ceiling of the operator’s room and the apartment upstairs brought the realization that the price had to go up. And it did to ten cents a ride. In 1977, the cable cars were completely rebuilt. After 84 years the original gear drive was re-placed by a modern gear box with a DC motor. The movie F.I.S.T. included a scene that was filmed at the elevator.